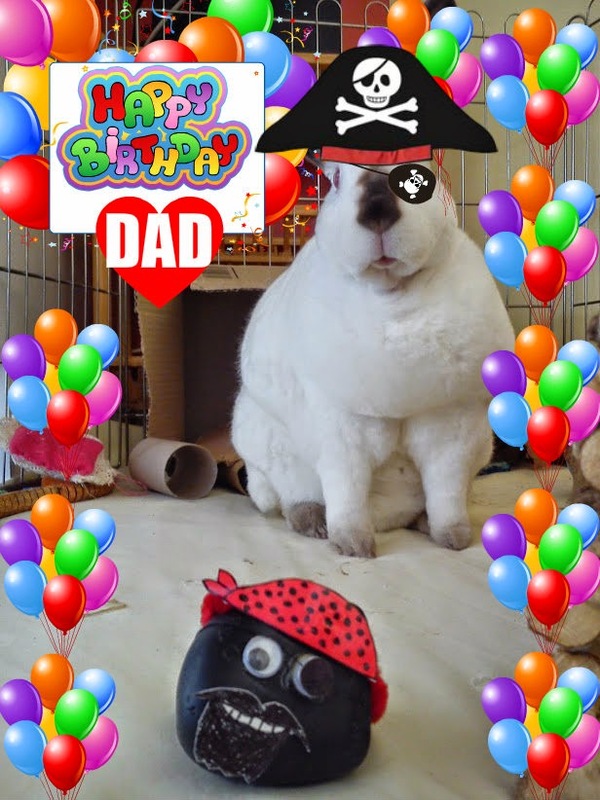 Speedy the cheeky house bunny: Happy Birthday Daddy! Style and Speedy ... good as it gets! Happy BDAy Dad! Happy Birthday to dad! Enjoy your day! Happy Hoppy Birthday to Speedy's Dad! Hope it's a totally pawsome day! A big warm happy birthday to your Daddy Speedy. We hope his special day is a great one. Happy Birthday to your Daddy, Speedy! Did you give him a kiss? Wow, a big ole Happy Barkday to Speedy's Dad! I hope you have a fabulous day and a wonderful year. Happy birthday!!!!! Pawty like a rock star BOL!!!! Happy birthday to your male human, Speedy! Speedy we hope your Dad has a SUPER special birthday!! Yey! Happy birthday Hoomin!!! You take good care of him Speedy ;-) ! Now that's the way to celebrate, Captn' Speedy! Stevie Wonder, HAPPY and a good old pirate song? You really know how to celebrate little rabbit. HAPPY BIRTHDAY, DAD! Happy Birthday to your Daddy, Speedy! Happy birthday to your daddy. Hugs. Happy birthday to your daddy Speedy. Happy Birthday to Speedy's dad. Have a great day. Happy Happy Birthday to your Daddy! Hope he is having a great one! Hey Cap-n Speedy and Bashful, a huge "Arrrrrrrr Matie" to your day on his special "Happy Day". Pees, we were jammin to the Parnell Happy song, thanks! We love your card Speedy! Happy, Happy, Happy Birthday to your very special Daddy! Happy Birthday to your Daddy! We hope his day is purrfect! What a festive graphic with both you and Bashful! Happy birthday to your daddy! Happiest of birthdays to your dad! Happy Birthday to your daddy! Will he dance with you to Pharrells song? You all do everything with style! Happy, Happy Birthday Day, Dad! Okay, where is the cake...sorry, I just love birthday cake. Happy Birthday to your Daddy!! Beelated Birfday wishez fer Mistur Nick n many many more!!! Hopin ya had a grrreat day! !